Ankama Gamesâ€™ DOFUS has been one of those games that has quietly met with success over the years of its life, even spawning WAKFU recently. We take a look at DOFUS and see how it measures up in our latest review. Read on! Played DOFUS? Let us know what -you- think in the comments. 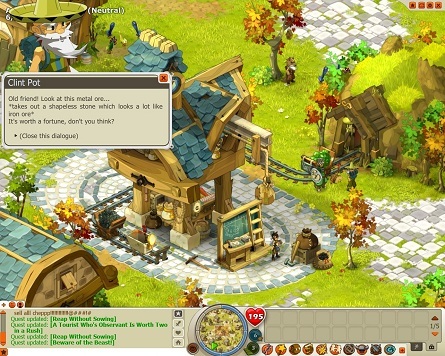 I canâ€™t say enough about how impressive and charming are Dofusâ€™ visuals.Â The game sports cute, colorful character models and environments that manage to be reminiscent of fantasy anime archetypes while still presenting a unique and distinct style.Â I tend to be pretty glowy over Ankama Gamesâ€™ art styles across their various media, and while I know that the anime-inspired graphics arenâ€™t quite everyoneâ€™s cup of tea, there can be no doubt that the attention to detail and lovingly crafted environments in Dofus are delightful.Â The gameâ€™s sounds and music are likewise nice, although there isnâ€™t any voice acting or range of crazy sound effects outside of the clamor of battle.Â Dofusâ€™ music is just as charming as its visuals, and can be sometimes wistful, other times rousing, although the game could use a bit more variety here.